Claire Clark is a New Yorker who travels to Florida. Her mother is from New England and father from Yugoslavia. They are both architects. She and her younger sister grew up being aware of their home environment. They lived in a well-planned community in Forest Hills and were active participants in community affairs. Their father helping out on community planning committees and their mother helping out neighbors with the architectural design of kitchens and bathrooms. Claire started her art at an early age. As a family, they did watercolors together, she starting at the age of three, on summer vacations. In the backyard she became aware of the growth of vegetables and plants. In the morning, seeing the morning glories in full array and then closing up. Digging up carrots and turnips; watching leaves turn color and some losing their leaves. Planting stayed with her during the Second World War. She had her own victory garden where she grew rows of corn. She also helped out with her parents gardens with tomatoes, squash, eggplants, swiss chard, parsley and mint. Digging up and putting fertilizer on the plots were all a part of the chores. Digging in the sand at the beach and on her own in her studio or in the garden were all lively activities for her. She loved quoting her Grandmother saying you can dig a hole and get to China. In High School Claire took a ceramic class. 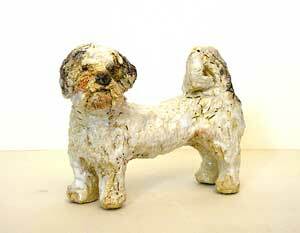 Here she was able to fire and glaze her small sculptures. During High School she also took Saturday classes at the Museum of Modern Art. She did a series of tempera paintings and also became very familiar with the museum, visiting it every week and seeing their latest shows. She became more involved with painting, first studying with Howard Trafton at The Art Students League of New York, and then with Harry Sternberg and then sculpture with John Hovannis. 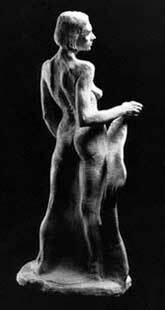 At Bennington College she studied painting, sculpture, and etching, and became more drawn to sculpture. She worked at the Museum of Modern Art in a non-resident term with Ms. Constantine. Ms. Constantine liked the abstract work. At that time Claire did realistic drawings with the model and worked with the model with an armature and clay. It was a very exciting time for her. Every time the model turned, she felt there was so much fresh to look at. Her likenesses were good from the start. She continued studying sculpture with Nathaniel Kaz and John Hovannis. Proportions, application of clay, armatures and casting were all a part of this learning process. 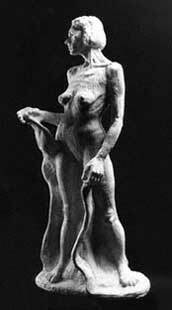 After Bennington College Ms. Clark (Radoslovich) went to Cranbrook Academy of Art as a sculpture major. Here she worked abstractly. There were very few models and so she started really building with terra cotta. At this time, she was also welding, learning ceramics and throwing on the wheel, doing etching and dry point and wood and stone carving. Her subjects were figurative. Then she went to the University of Oregon in Eugene where she was an assistant in sculpture to Dentists. She took a full term of courses. She had her own studio as she previously had at Cranbrook Academy of Art. Here she did hands holding a peace dove. She found the people quite different from New Yorkers. A different set of values were at play. It was pleasant for her being in a College town but she felt it was not for her. Then she went to Teachers College in New York and studied to be a High School Teacher. The first job she had started in January 1966. She worked with the Board of Education for 25 years. She started in Junior High and ended up in High School which started in 1971 when she was permanently placed at Prospect Heights High School. She had some good lesson plans, and she may get them together in a book form. She learned how to reach the children with painting and design; helped them to build their vocabulary and not to be afraid to express their ideas in pen or pencil. She taught ceramics too. The children needed to hold on to something. This in turn gave them something to work with. While teaching art in High School she did ceramics at Hunter College, sculptures in the summer at ASL, and later started acting to help keep everything together. She was in many plays and really loved acting, but found it best not to do both. Since she retired in 1991, she does only sculpture. She started with an armature and then decided not to ever use one again. Her familiarity with clay helped her build figures without an armature. It took practice. After 2 years of studying full time again, she won a McDowell Traveling Scholarship. She went to Rome and visited Naples, Sienna, and Florence in Italy. She did stone carving at the American Academy of Rome with Simon Verite. She helped him with a fountain he was making for the Academy in the Villa Aurelia garden. Since then she has continued studying sculpture at the League with Barney Hodes and Leonid Lerman; and been firing her clay at Hunter College. 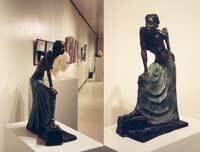 She continued to show her work with other groups: The Pen and Brush Club, Professional Sculptors Guild, Visual Individualists United, Artists Craftsman of New York, and Burr Artists. She has had a one-man show at the Art Students League for her McDowell scholarship and then more recently, she showed her work at the Republic Bank on East 8th Street - Through Their Windows. At the league, she also won a Nessa Cohen scholarship. With other Nessa Cohen winners she is showing at the Cork Gallery at Lincoln Center in New York during February 2000. Claire Clark has a good size studio in Williamsburg, Brooklyn, with her own shuttle kiln. The kiln is Bailey's 38" high by 27" width and depth. She hopes to do more of her abstract work and at continue to do her realistic work at the League with the model, for now.